When it comes to considering supplements for treating hair loss or alopecia, then nothing can be more important than – BIOTIN or vitamin H. Because, in most of the cases biotin deficiency is the main reason for the decreased hair growth and increased hair loss. Especially in the recent years, taking biotin supplement for hair growth has become very popular. But if you are still wondering – if it is just a hype, can this supplement really provide results or which one is better and so on….. Then in this article, you will find answers to all the queries about biotin for hair growth. 1 How exactly does Biotin Work in Treating Hair Loss? 2 Who is in Need of a Biotin Supplement? 3 How Much Biotin is required for Thick Hair? 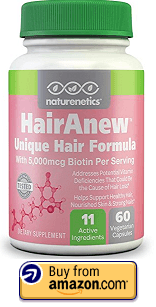 4 What Should a Biotin Supplement Contain? 7 Why Some Biotin Supplements Don’t Seem to Work? How exactly does Biotin Work in Treating Hair Loss? As we already know, hair is made of keratin (a type of protein) which is built from the amino acids. These amino acids are formed as a result of cell enzymes and biotin reaction. So, biotin plays an important role in hair growth process. A study was conducted in 2015 on several women experiencing hair loss. Few of them were given a supplement containing biotin and others were on placebo pills 2 times per day for 90 days. At the beginning of the research and at the end of it, digital images were taken and hair washed to check the amount of hair loss. Surprisingly, women taking biotin supplements experienced a significant hair growth and less hair shedding (1). The article published by Cambridge University Press states that biotin or vitamin H is one of the important element in hair growth. Because, biotin deficiency results in incorrect metabolizing fatty acids which often lead to hair thinning (2). Though we can get enough biotin from our daily food, due to fertilizers and GMO seeds we are not able to grasp the amount necessary for the body from the food. As biotin is water soluble, it is safe to take them in supplement form as any unused reserve of biotin is flushed out through urine easily. Who is in Need of a Biotin Supplement? However, biotin supplements can be helpful in some other cases as well where hair loss is caused by other reasons. Some of them are anemia, thyroid disorder, hormonal changes during pregnancy, stress, and certain medications (immunosuppressants, antidepressants and acne medications). 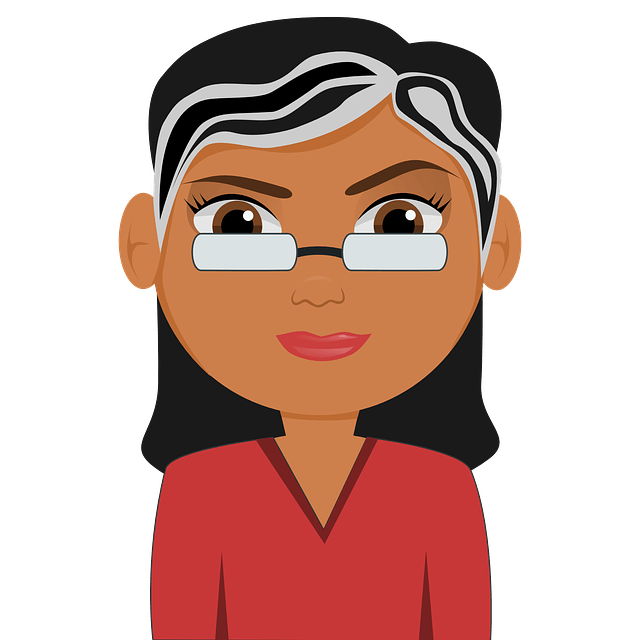 How Much Biotin is required for Thick Hair? However, most of the supplements available in the market have dosages of 5000mcg and more. As biotin is a water soluble vitamin, consuming it in more amounts is not toxic. Excess biotin is usually flushed out of the body through urine. Just to avoid any negative situations, we recommend consulting a physician to analyze the proper dosage for maximum benefits. What Should a Biotin Supplement Contain? There are several brands manufacturing biotin supplements which make us difficult to choose the best one. That is why we have curated a list of things you have to consider while looking out for the best biotin supplement. Quality of the Supplement: Make sure to avoid supplements that contain unnecessary ingredients and synthetic material which decrease the quality of the biotin present in them. Some of these ingredients may not have been tested for efficacy and safety. Safety: When choosing a supplement, make sure it is manufactured in a safe facility that is certified by GMP (good manufacturing process) or approved by FDA. Hypo-allergic: If you have any allergies, make sure the supplement doesn’t contain any allergic ingredients. Or else make sure the label states hypo-allergic. Should be combined with Other Natural Ingredients: Biotin products should be combined with natural ingredients like Hyaluronic Acid, Vitamin A, C, E, and Collagen. They promote biotin absorption and help in supporting hair growth. Other Considerations: If you are a vegan or vegetarian, make sure the product states it to be vegetarian-friendly. Because some products contain gelatin capsules which are taken from an animal source. Pectin (plant-derived) is an alternative used for vegetarians or vegans. Shouldn’t contain Added Flavors: Some brands add unnecessary sweeteners to the biotin supplements. Consumption of this kind of supplements not is recommended for diabetic people. These products were very close in terms of reviews, ratings, results, effectiveness, which made it a difficult to pick up the best. In our option and research, among the top 10 biotin supplements for hair loss, the winner is – “Natrol Biotin Maximum Strength Tablets”. This product contains 10,000mcg of biotin and 66mg of calcium in each capsule. It promotes healthy growth of hair, strengthens hair follicles, avoid breakage and prevents premature hair fall. It helps the food convert into energy and regulates blood sugar levels. Apart from that, it also helps to promote the health of nails and skin. Recommended dosage for adults is 1 tablet after any large meal. Avoid taking more than 1 tablet as it can cause stomach cramps or constipation because of its high biotin dosage. For some people, it has increased acne initially but gets cleared in few weeks. In this product, each liquid soft gel contains 5,000mg of high potency biotin with organic coconut oil for added benefits. The biotin in this product helps to convert macronutrients into fuel sources which help to strengthen hair follicles and prevent premature hair fall. Apart from quick absorption, coconut oil present in it moisturizes and nourishes the scalp. This product also contains organic yellow beeswax which is an excellent ingredient for stimulating hair growth and its thickening. Recommended daily dosage is 1 soft gel per day after meals. But excessive dosage can lead to stomach discomfort. This product has acclaimed that it is completely safe and suitable for vegetarians and vegans because the capsules don’t contain gelatin. The unique formula of this product contains biotin and 10 active ingredients that are helpful for hair growth. These 10 ingredients also improve the performance of biotin. These supplements provide you with a healthier and more vibrant hair. It addresses any vitamin deficiencies in the body that are resulting in the hair loss. Vitamin C present in this product slows down the aging, prevents premature graying of the hair, strengthens hair and improves collagen production. Other ingredients available in this product are Bamboo extract, Vitamin E, zinc, inositol, and silica. Recommended dosage for adults is 2 capsules per day. The team of experts who created HAIRFLUENCE stated that this product is specially formulated with a natural and synergistic blend. It contains several minerals, amino acids, vitamins which work in harmony to provide effective results in improving hair growth and preventing hair loss. The bamboo extract present in it nourishes the important tissues of hair, skin, and nails. It contains collagen which improves body’s collagen production and promotes a healthy scalp. The keratin present in it repairs damage hair and supports hair growth. Vitamin B12 which is essential for red blood cell formation carries oxygen to the hair follicles and scalp. Vitamin D3 present in it wakes up dead hair follicles or encourages the growth of new hair follicles. Recommended dosage is 2 capsules per day with a large meal. Make sure to avoid exceeding recommended dosage as it can lead to headache or skin irritations. This product is not suitable for pregnant, nursing women or children under the age 18. This product is a unique blend of Collagen, Silica and Hyaluronic acid which makes it an effective treatment for healthier looking hair and nails. This formula is naturally driven from rice which contains a superior phytoceramide. It also contains several other ingredients like vitamin C, A, D & E which acts as powerful antioxidants which protect hair and skin against sun’s damage. Previously this product was known as Optimum Phytoceramides but the company has relaunched it with same quality and improved formula. The bottle comes with 30 capsules without any filler ingredients. Recommended dosage is 1 capsule per day with a large meal. Each capsule contains 5000mcg of biotin which is effective and safe dosage for treating hair loss. If you have been experiencing hair loss along with brittle nails and dull skin, then Omegaboost biotin supplements is recommended for you. This product supports cellular energy, maintains healthy hair and strong bones. It can work on the body metabolism and release energy to the body, till the cellular level which helps to rectify many issues that lead to hair loss and unhealthy nails. This product also contains calcium which is helpful in strengthening hair shafts. The capsules are made of gelatin, so it not suitable for vegetarians and vegans. Recommended Dosage is 1 capsule per day with a larger meal. The bottle contains 120 capsules, each capsule contains 5000mcg of biotin. This product doesn’t contain any added sweeteners so they are safe for diabetes people. 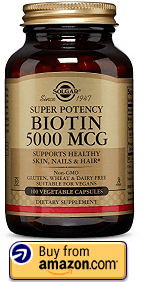 If you are looking out for a supplement that provides enough biotin then solgar super potency is one of the best. It contains biotin, calcium, phosphorous, microcrystalline cellulose, vegetable cellulose and vegetable magnesium as its ingredients. Biotin and calcium help to speed up the cellular metabolism and provides more energy for accelerating nutrient breakdown. It enables the nutrients to reach the scalp through our bloodstream for a healthy hair. Recommended dosage is 1 capsule per day with a large meal. Each capsule contains 5000mcg which is enough for promoting hair growth and reducing hair loss. The capsule is not made up of gelatin so it completely safe for vegetarians and vegans. This product contains 120 capsules of 10,000mcg of biotin in each one. It helps in preventing excessive hair loss, encourages the growth of new hair and enhances the hair strength. Apart from that, it helps to get rid of colored and brittle nails. The capsules are in normal size which makes them easy to swallow. Aside from the cosmetic benefits, it is very essential in boosting energy and stamina. Recommended Dosage is 1 capsule per day with a large meal. If you have been looking for a rich source of biotin for an affordable price then Incite Nutrition is the best one. It contains 200 vegetarian capsules at a dosage of 10,000 mcg per capsule. And the best part is, it comes with 100% hassle free, money back guarantee. It is helpful for preventing hair loss, encourage hair growth, strengthen nails, and improve skin condition. You can observe noticeable improvements within few weeks. 1 capsule per day with large meal is recommended for effective results. This product contains a unique formula which not only helps to reduce hair fall but also treats the root cause of it as well. DTH (Dihydrotestosterone) is a hormone which makes the hair follicles weak, fall out and thin down. But the herbal complex present in this product naturally reduce the DTH levels in the body. The herbal complex includes pumpkin seed, saw palmetto, and pygeum (African tree park). As per the manufacturer, the combination of biotin and herbal complex is said to reduce hair fall within 2 weeks and increase in hair growth with 2 months. Recommended dosage is 1 capsule per day after a large meal. Why Some Biotin Supplements Don’t Seem to Work? Allergic to Other Ingredients: Biotin supplements contain other ingredients which help the biotin to work effectively and increase its absorption. However certain ingredients like soy, yeast, fish, and gluten may lead to allergic reactions in certain individuals. This can decrease the efficacy of the product. Cheap Quality: Some biotin supplements present in the market are sold at a very cheap quality. It is important to read the packaging and ingredients list present on the product label before purchasing the product. 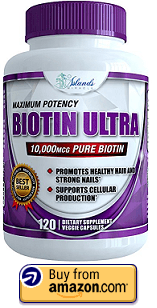 Less amount of Biotin: If the product contains less biotin presence then it may not provide the results effectively. If you are experiencing any one of these, then stop or decrease the dosage of the supplement. However, we recommend consulting a doctor before starting any supplement to know the right dosage as per your medical condition and age. 1) How long does it take to see the results? It is difficult to tell the exact time frame for achieving the results because it entirely depends on the person’s hair quality, the level of damage, healing capacity and other factors. The time usually differs from one person to another. However, as per the user reviews, it has started showing improvement in 2 – 3 months of time. 2) Can Pregnant and Breastfeeding Women Take Biotin? Usually, biotin is required for pregnant and nursing women as they are more prone to its deficiency. However, the dosage is actually different and varies from others. So, we recommend consulting a gynecologist for proper dosage and to avoid any negative instances. 3) Is Biotin Alone Enough for Hair Growth? Biotin alone is not enough to improve hair growth effectively. There are other factors as well you have to consider for effective results. Eat healthily, exercise regularly, drink plenty of water, avoid stress are some of the things that speed up the process of hair growth. 4) How Often Should We Take a Biotin Supplement? Take 1 capsule per day with a large meal. Don’t exceed the limit until unless specified by the doctor. Avoid taking it for a few days, then stopping it and continuing in other time. This will not provide any results. 5) Will Biotin Interfere With My Prescribed Medication? Yes, biotin can interfere with some medications and reduces its efficiency. In case, if you are on any medications, we recommend informing your doctor before taking them. 6) How will Biotin Affect my Skin? Biotin is helpful in treating skin condition like eczema but it can also cause acne breakouts for some people. However, acne is only caused in initial days as a reaction of the biotin absorption in the body. But it will reduce within some time. So, we recommend taking plenty of water to reduce acne and boost the effectiveness of biotin. 7) What are the Other Benefits of Biotin Apart from Hair Growth? Biotin also helps to strengthen nails and enhance skin immunity. It also helps to break down fats, proteins, and carbohydrates, so you will get more energy from it. 8) I hate taking supplements, is there any other way to take biotin? As biotin is a natural vitamin, it can be found in food sources that include carrots, halibut, blackberries, cucumbers, almonds, eggs, goat milk, onions and others. 9) Does Biotin lead to Weight gain? Nope, it doesn’t. It has no effect on weight gain or weight loss. 10) Does Biotin Lead to Increased Hair Growth in Others Areas of the Body? Nope, biotin doesn’t increase hair growth on other parts of the body like face, under arms, legs or hands. Because the hair on our body is different from the hair on the scalp. Biotin contains a molecular signal that just helps to grow hair on the scalp. 11) Are the Results Permanent? Yes, but once you stop taking the pills, you have to maintain the biotin levels in the body at least through natural food sources. Apart from that, you have to maintain a healthy lifestyle, reduce stress levels, eat healthily and drink plenty of water. 12) Does Biotin Work for Both Men and Women? As per the reviews and research, both men and women have received positive results by using biotin supplements. 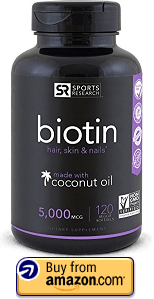 Our pick for the best biotin supplement for hair growth is “Natrol Biotin Maximum Strength Tablets” It has the maximum amount of biotin in it and doesn’t contain any fillers or allergy causing ingredients. This means that it can help many individuals in reducing hair loss and improving hair growth. There are several other long-term strategies for treating hair loss and prevent breakage. Examples are Aloe Vera, Apple Cider Vinegar, Eggs, Onion Juice, Natural Oils, and Coconut Milk. Do you know any other product that works better than the above mentioned? Click Here to learn more about natural home remedies to treat hair loss. Share your experiences, suggestions, and queries in the comment section below. We clarify them as soon as possible…We are glad to help you find a solution for hair problems.